Samplr for iOS systems provides users with a truly hands-on feel when modifying and editing their audio tracks. This gesture-based interaction is quite different when compared to traditional packages which require the individual to modify existing fields or to manually adjust settings. The total file size of this package is 53.8 megabytes. It will require Android 6.0 or later versions in order to function properly. There is currently no free version of this bundle although there is a variant available for iPad users. what is the Samplr App and what does is do? One interesting feature associated with Samplr for iOS is that it incorporates a gesture-based mechanism so that users can make adjustments with their fingers. The individual will simply touch the waveforms displayed on the screen. Various physical movements will then automatically adjust these shapes and the playback will likewise change. It is also possible to zoom into a specific section of a track in order to make more detailed adjustments. As this software was solely intended to be used in conjunction with devices powered by a touchscreen, the level of functionality is superior when compared to many other products on the market. The possibility to select from eight different playback modes. Six samples can be played back at the same time (with up to eight audio segments within each track). Background audio can be chosen and combined with other instruments. The user can adjust five different audio parameters within each sample. A manual that provides detained operating instructions is included at no extra charge. Recent updates include support for iOS systems and a handful of bugs have been eliminated. Samplr for iOS was developed from the ground up. This is not always the case with other applications that were translated from the PC to the smartphone market. Therefore, it offers a streamlined user interface and a host of intuitive tools. The levels of compatibility are just as impressive. It can be synced with third-party storage packages such as Dropbox and AudioShare. MIDI connections are supported alongside common file types such as AIFF and WAV. Therefore, this program is ideally suited for situations when a higher degree of accuracy is required during audio editing and sampling. It is also great in terms of its hands-on appeal, as users can make quick and simple adjustments; perfect when time is of the essence. Samplr can be used by professional editors and audiophiles with ease. As no Internet connection is required, it is just as useful while out and about. In the event that alternatives to this program are desired, there are a handful of useful options which can provide similar results. 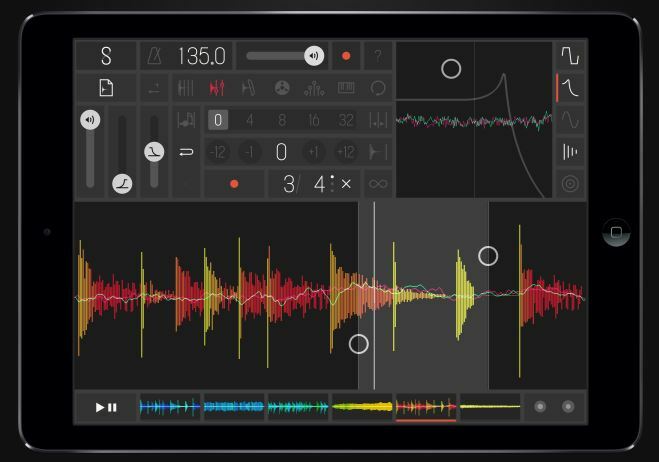 These include NonoStudio, BeatMaker 2, NodeBeat and GarageBand. All of these will require a single payment before activation. However, Figure is a free option. While its functionality is slightly limited, it could still prove to be a worthwhile consideration.